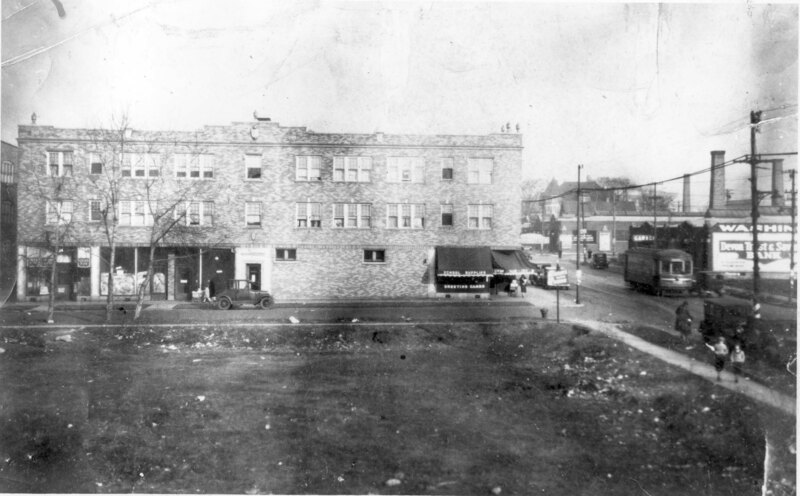 This article originally appeared in the Spring 2016 issue of The Historian, the online quarterly published by the Rogers Park/West Ridge Historical Society. All photographs used courtesy of their image database. Matthew Amyx is a History PhD Student at Loyola University Chicago and the Public Media Team Leader for the RPWRHS. Over the summer of 2015, a Change.org petition to expand or rebuild the Northtown Library collected over 600 signatures from the residents of West Ridge. The one-story building at 6434 N. California Ave. hosts 140,000 visitors each year, but it has not been renovated since opening in 1962. Petition-signers complain that the library, despite its popularity and the hard work of its staff, lacks space, needs more up-to-date technology, and offers community resources insufficient to reflect the diverse demographics of West Ridge. Additionally, they claim the library’s parking situation, practically limited to street parking in a busy neighborhood, severely inconveniences patrons. While the petition has received considerable support and is backed by 50th Ward Alderman Debra Silverman, residents will need to exercise patience. Pamela Stauffer, West Rogers Park Community Organization Chairwoman, anticipates a minimum budget of $6 million for the endeavor, which is still in its planning phase, and recent library projects in Chicago have taken four years or more to complete. The petition signers should not lose hope, however, as very similar grassroots appeals created the very successful previous incarnations of the Northtown Library. The first Northtown Library opened on July 31, 1939 at 2502 Devon Ave. It had taken seven years of organizing and petitioning by the local Kiwanis Club, Northtown Women’s Club, Northtown Business Men’s Association, and PTA groups. By its one-year anniversary the branch, led by head librarian Marion Smith, had issued 6200 library cards and hosted 145,000 visitors and circulated nearly 200,000 books. The library building, a double storefront, quickly became one of the most popular in the city, attracting patrons from far outside of its district boundaries which ran west from Ridge Ave. to the canal and south from Farwell to Bryn Mawr. The library’s programs quickly outgrew its space. In January 1942, Smith started a very popular Book Review Club, but it had to meet in clubrooms on Maplewood Avenue. The library offered very strong children’s programs, such as a “Bring Your Dolly” story hour started by Children’s Librarian Bernice Perley in January 1942. Soon the weekly story hours were drawing an average of 233 children, but the space only accommodated 60 chairs. This unacceptable situation led West Ridge community leaders to petition Mayor Kelly for an enlargement. Sponsors included pastors, Boy Scouts, business groups, women’s clubs, Kiwanis, and the American Legion. The city approved the purchase and conversion of the adjacent corner building, a tavern and store, into staff space and a much needed children’s room. 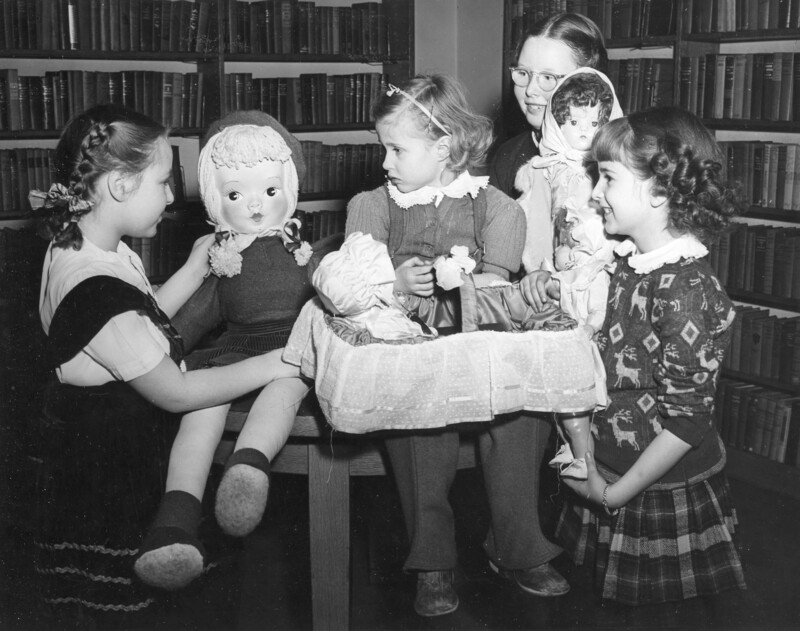 Girls participating in Doll’s Story Hour, c. 1945. 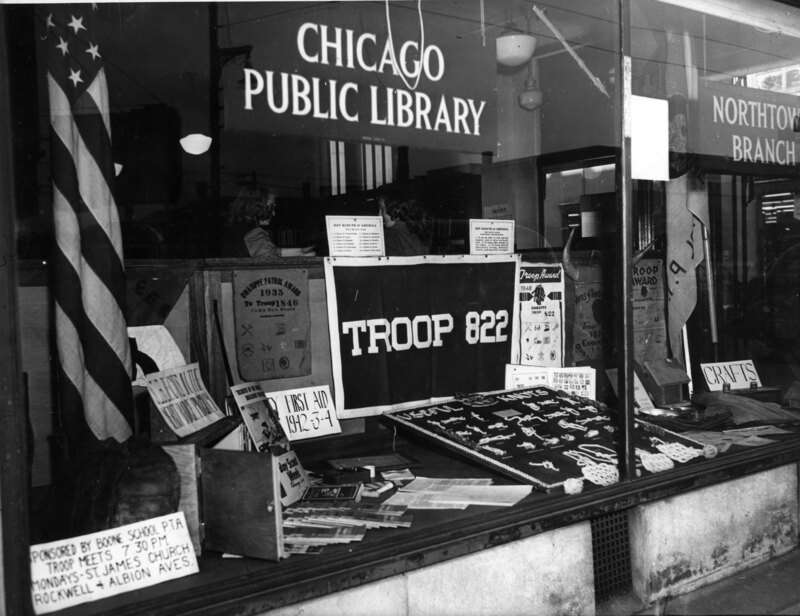 The Northtown Library made important contributions to community morale during World War II. It provided technical books to educate the defense workers that had flooded to Chicago. Families with members serving abroad checked out books on the countries where their loved ones were stationed. Smith told the Tribune that the library helped residents “take their minds off things for a while… These persons usually ask for mystery books – something which will challenge their brains and keep their minds occupied.” The library also offered avenues for the West Ridge community to aid those affected by the war. In July 1941, the library collected books to donate to locally stationed troops, and Perley organized a Girls’ Club that collected dolls for English war refugee children. In June 1945, the Northtown Library took part in a University of Chicago adult education program based on reading the classics, the first of several very popular Great Books programs that would occur on and off throughout the remainder of the 20th century. 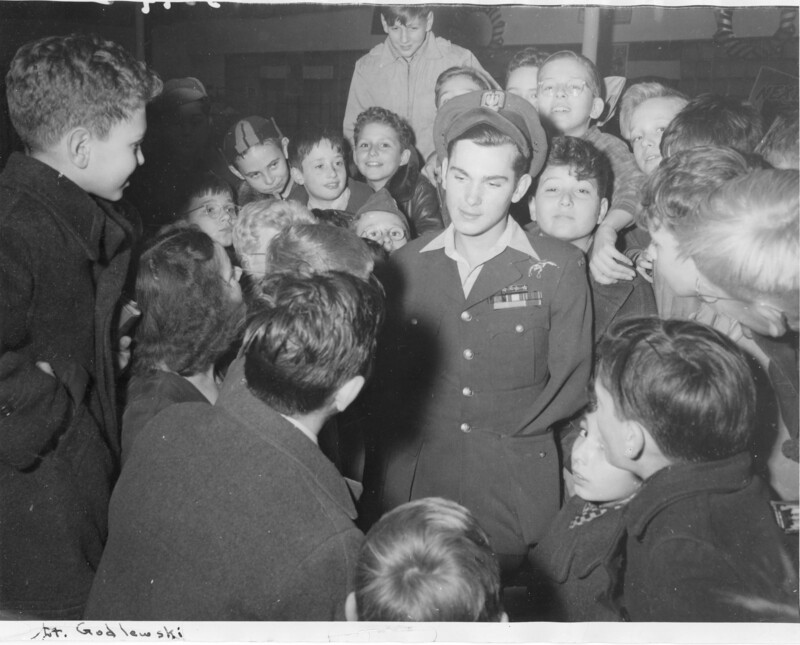 2502 W Devon Avenue, North Town Library -Children with Army Lt. Godlewski. In 1946, the library lost its lease on 2502 Devon, and moved two blocks over to 2710 Devon, away from the bustling business district. 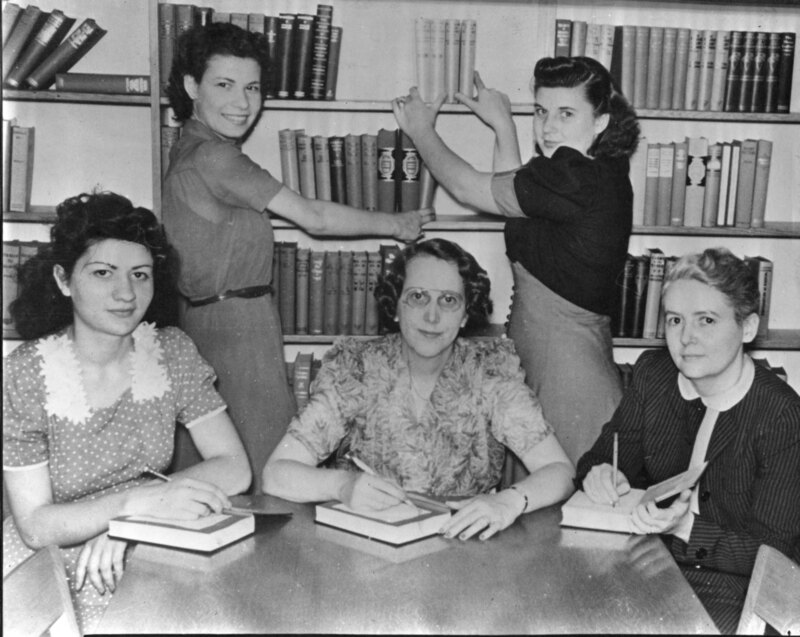 The library was still outgrowing its space, and in July 1947 the Edgebrook Library opened as a sub-branch of Northtown, with Elizabeth Vieser as assistant librarian under Smith. The space was painted blue and white and contained 3000 books, half for adults and half for children, with Northtown’s children’s librarians conducting the story hour there once a week. (The Edgebrook library has since moved three times and is now its own branch at 5331 W. Devon Ave.) Like today, space was constantly an issue during the period, with staff having to cram patrons in or find venues outside the library for programs. The advent of television dropped circulation some, but a fresh influx of families during West Ridge’s growth in the 1950s and 1960s brought it up again. Many empty-nesters became avid readers and brought their grandchildren to the library, bringing circulation in 1957 to 215,000. The demographics of the neighborhood were also becoming more diverse, and community members began organizing to petition the city for another expansion. Women using library materials, c. 1950. Construction bids began in September 1960 on the library’s current location, 6435 N. California Avenue, which opened January, 1962. 125 feet wide with red brick, the new building included space for 50,000 books (up from 28,000 in the previous location), a multi-purpose room for library-sponsored activities, citizenship and Americanization classes for West Ridge’s growing immigrant population, and air conditioning. This was the first location intended as a permanent space, as the Devon locations had all been rented. Interestingly, the 2710 Devon location suffered a $10,000 fire the week before the move, although most of the books had luckily already been transported. The new library opened with a new Chief Librarian as well, Mrs. Gertrude Gscheidle. Designed by City Architect Paul Gerhardt Jr., the building cost $174,438.00 to construct and $56,490.70 to furnish. Despite the expansion, the Northtown Library still struggled with containing and staffing its programs; by 1965 it had the largest circulation of any library in the north side district, with 272,051 books loaned. The library’s popularity continued throughout the century, claiming the highest circulation of any library in the system in 1986. As the history of the library demonstrates, the Northtown branch has always struggled to find space for its programs. This difficulty is only exacerbated by the growing needs of an increasingly diverse population, and is made considerably worse by the lack of available parking. The library has very few dividing walls, and while this trait gives it an open feel it also prevents the existence of private study space. In the comments section of the Change.org petition page, many of the signers sadly stated that they drove to other libraries in the suburbs because they did not feel the present building could meet their needs. The petitioners can take heart, however, in knowing that the city has listened to West Ridge petitions in the past to expand or renovate the Northtown Library.